Nakameguro Taproom is well worth visiting if you’re in the area, with good beer at reasonable prices and a decent atmosphere conducive to a fun night out drinking. Paired with pizza, Nakameguro Taproom is a viable alternative for other pizza places in Tokyo, as long as you can get over the amount of wood in the bar. It’s non-smoking across the whole bar, tax is included in the price and it doesn’t have a table charge either, so no nasty surprises at the end of the evening. There is also free Wi-Fi if you ask behind the bar for the password. If you find this sign, you’re on your way. Nakameguro Taproom is another Baird Beer drinking establishment, with this one serving their range of beers and also craft pizza since May 2008. Based in Nakameguro, which is two stops from Shibuya on the Toyoko Line, Nakameguro Taproom was the first Tokyo bar for Baird Beer. If you like wood, you’ll like this place. 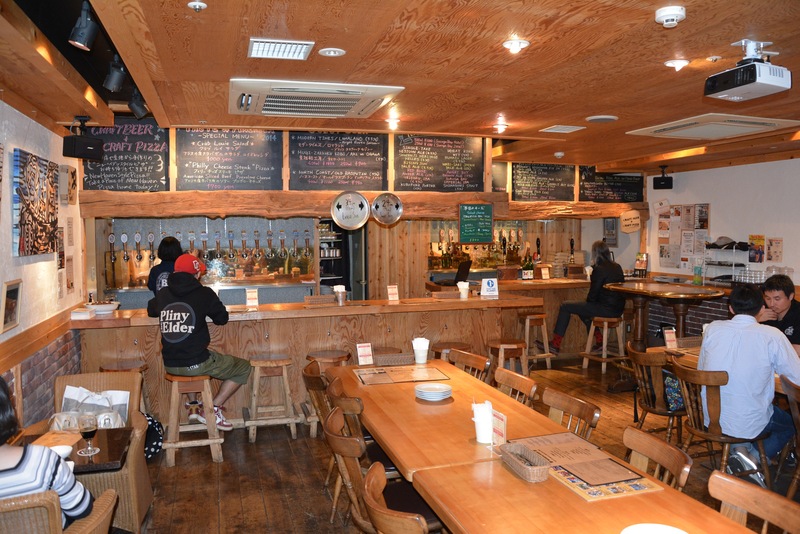 Located on the second floor of a residential/office building, Nakameguro Taproom is decked out from floor to ceiling with wood. Wood everywhere. Wood tables, wood chairs. Heck, I wouldn’t be surprised if the TV is also made out of wood. Still, the bar is nice and open with some good ambient light coming through. When it does get dark, the interior lights aren’t going to dazzle you either. Baird Beer is a pay-at-the-end place, which could be very dangerous, but BeerTengoku takes its work seriously and not does condone heavy drinking. At all. No way. 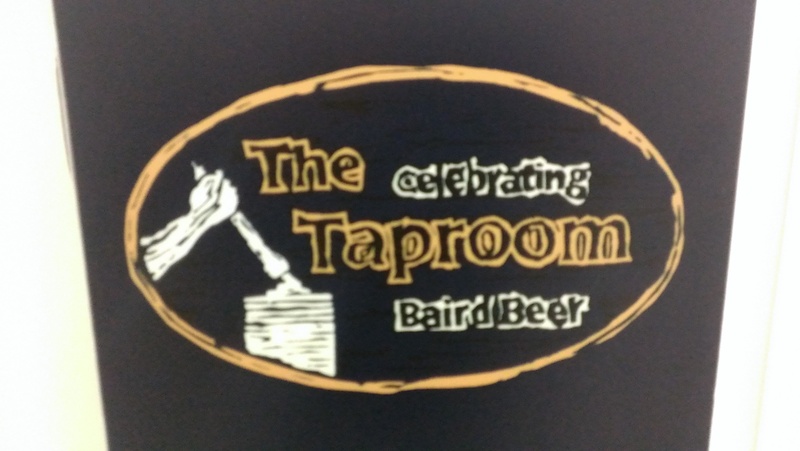 With Nakameguro Taproom being Baird Beer owned, the range of beers is restricted to Baird Beer. Never a bad thing as when we went there was a choice of about 25 taps. How the heck do you choose? Well, the friendly, chatty bar staff were very helpful in pairing the beers with the food we had ordered. “Which beer to drink?” is the most difficult question of the day. Still can’t decide, can you? Let’s slow down before we get to the food and move back to beer. The range is wide and varied. The regular range of Baird Beers are on tap, with prices at ¥1,000 for a 500ml glass, 400ml in the case of the Suruga Bay Imperial IPA, and ¥600 for a 250ml glass, 200ml for the Suruga Bay Imperial IPA. The seasonal beers follow the prices for the Suruga Bay, so 400ml / ¥1,000 and 200ml / ¥600. There are some imported beers at Nakameguro Taproom as well but slightly pricier. The Cool Breeze Pils is refreshing and thirst quenching. One of the seasonal beers is Baird Beer’s Big Red Machine. We had the Baird Big Red Machine, Baird Brewer’s Nightmare IPA, Baird Cool Breeze Pils, and the Baird Teikoku IPA. The first three are some of Baird Beer’s seasonal range that are well worth going along for a try. The Baird Teikoku IPA is one of my personal favourites from the Baird Beer range. As much as I enjoy drinking at home, Baird Beer’s taste much better on tap. The Bashamichi BBQ pizza is made using pork from the Baird Beer Taproom in Bashamichi, Yokohama. There are other foods available, such as this special salad. Nakameguro Taproom’s food is based around New-Haven style pizza, which is thin and crispy with black charred parts around the edge. Pizzas come in two sizes, 24cm and 34cm, and prices range from ¥1100 – ¥1800 for the smaller size and ¥1700 – ¥2200 for the large. There are also some monthly pizzas as well. On top of this, ba-doom-tish, you can also create your own pizza too. We had the Bashamichi BBQ, which uses smoked pork from the Bashamichi Taproom, also owned by Baird Beer. At the weekend, the Nakameguro Taproom also offers a special lunch time deal whereby you can order any pizza on the menu and you also get a side salad and a soft drink. Unfortunately, there is no option to upgrade the drink to a beer no matter how much money you offer the bar man. Perhaps something to implement in the future. The closest station to the Nakameguro Taproom is Naka-meguro on the Tokyu Toyoko Line that also connects to the Tokyo Hibiya Line as well. Take the south exit, turn left outside the barriers, and it’s on the second floor of GT Plaza, located behind the GT Tower. This is a superb venue. I have photographs from here from its 1st anniversary in May 2009. Yes, they are SFW and publishable. X=)} You should mention its frequent drinker program. Buy the card for ¥10,000, and you’ll get two free pints for your money. No directions? Turn right from the station and it’s in the GT PLAZA building, 3rd floor.